Around 700 people had been detained, most of them in Paris. Police carried out checks on people arriving at the capital's train stations, confiscating items that could be used as projectiles as well as surgical masks and goggles used to protect against the effects of tear gas. Some of those arrested were carrying hammers, slingshots and rocks. But many of the demonstrators insisted they wanted no violence. Macron's decision early in his presidency to slash taxes on France's wealthiest is particularly unpopular with the protesters. Arguing that such a move was necessary in order to boost investment and create jobs, the former investment banker has so far ruled out re-imposing the "fortune tax". 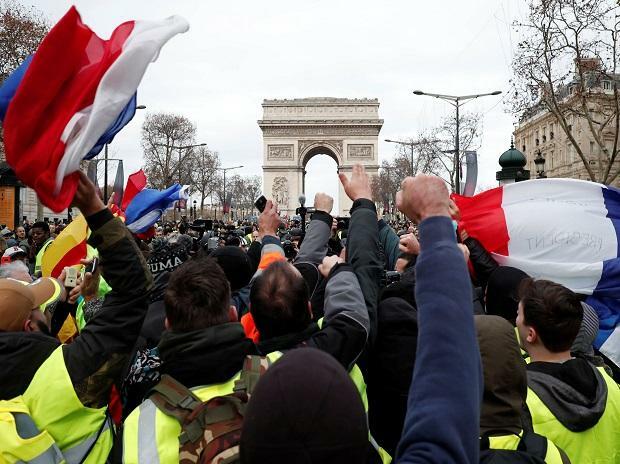 The climbdown on higher fuel taxes -- which were intended to help France transition to a greener economy -- marked a major departure for the centrist president.